We’ve already seen a number of renders showing Apple’s ambitious Campus 2 project as well as the progress in Cupertino, California at the site of the future spaceship-like building. 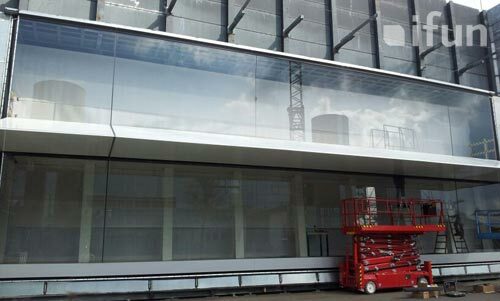 Now photos shared today by German site ifun.de depict an early shot of architectural samples with the design slated for Apple Campus 2. According to the site, the structure was spotted on the premise of Josef Gartner GmbH in Gundelfingen, Germany. The sample structure of this segment of Apple Campus 2 presumably exists to test the materials being used for the building as the site has previously mentioned Gartner’s believed role in the project. While the photos do not reveal anything new exactly about the design of the future Apple headquarters, they do offer some perspective on the scale of the structure using the construction equipment seen in each photo as a reference. While the photos above were captured in Germany, similar life size models have been constructed in Cupertino. Last month, we saw a 3D flyover view depicting the grand scale of the expected final project, and the latest photos of the actual site have shown the project in its current form. Apple Campus 2 designer and architect Norman Foster of Foster + Partners has discussed in the past his experience with working on the project with Steve Jobs on the project including the influence from Stanford’s campus on the Apple building’s design. Apple Campus 2 is expected to open at some point during 2016.